 One of three flavors of new Muesli Cups—two are gluten free—from Bob’s Red Mill (photo courtesy Bob’s Red Mill). 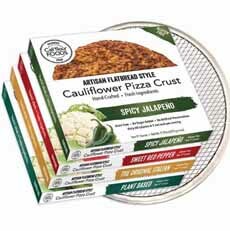 Cali’flour cauliflower pizza crusts, including new Jalapeno (photo courtesy Cali’Flour Foods). Snikiddy’s baked cheese puffs, organic and gluten-free (photo courtesy Snikiddy). 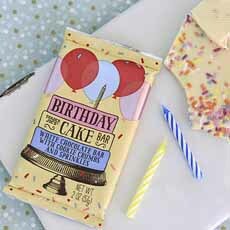 Trader Joe’s Birthday Bar: white chocolate, cookie crumbs and sprinkles (photo courtesy Trader Joe’s). If you like granola or oatmeal, you’re a potential fan of muesli (MEW-slee). Created by a Swiss physician in the late 19th century, muesli is a blend of whole grains, toasted seeds and dried fruits. It’s a comfort food that’s good for you (more about museli). 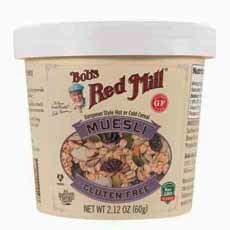 Bob’s Red Mill has created a gluten-free muesli that is just as delicious and nourishing. You can eat it hot like oatmeal, like any cold cereal topped with milk or yogurt, or the traditional Swiss way: topped with apple and soaked in milk overnight. Take the 2.12-ounce cups with you or enjoy them at home. The three flavors are also available in 14-ounce bags. The muesli is currently exclusive at Whole Foods Markets, or online at BobsRedMill.com. Add cheese and your favorite toppings, pop the pizza into the oven, and you’ll soon snack or dine on a crisp, totally satisfying low-carb, low-glycemic pizza. You can also use the crusts more creatively, for example, to make gluten-free grilled cheese sandwiches and panini. The all-natural, grain-free crusts have 60 calories and 1 net carb per serving, and are hand-crafted from simple, fresh ingredients: vegetables, mozzarella, eggs, basil. There is no added sugar. More news: The line, which was originally frozen, is now shelf stable (no refrigeration required) for up to two weeks. There are also gift cards. Order yours at CaliflourFoods.com (also on Amazon). If you like cheese puffs, we’d like to introduce you to the more elegant puffs from Snikiddy. 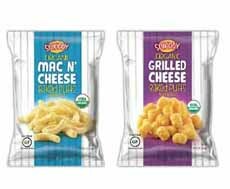 “Grilled Cheese” and “Mac N’ Cheese” are marketing fluff, rather than an indication of the cheese flavor. Neither tastes like grilled cheese or mac and cheese, but both taste really good. The Mac N’ Cheese is airier and our preference; Grilled Cheese has a more assertive cheese flavor. Warning: Trader Joe’s Birthday Cake Bar is addictive. We no sooner had our first bite than we were ready to head to the store to buy out the remaining stock. The finest white chocolate (trust us—we’ve tried every white chocolate we’ve ever seen) is topped with vanilla cookie crumbs and multi-colored pastel sprinkles, the latter naturally colored with beet juice, beta carotene and turmeric, rather than chemically-produced colors. The two-inch chocolate bars are just $1.49—the lowest price imaginable for chocolate this good. Don’t head to Trader Joe’s just yet: We’ve got to get there first!